The southern French city of Carcassonne is famous for its unique Roman and Medieval fortifications. 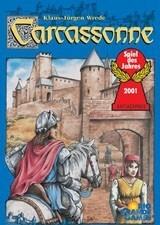 The players develop the area around Carcassonne and deploy their followers on the roads, in the cities, in the cloisters, and in the fields. The skill of the players to develop the area will determine who is victorious. This is the game that started it all for me. Played it a few times and then got into boardgaming. The thing i like about this is the simplicity of it. I only play with two expansions Builders and Inns. With these the game does not become bogged down in a whole host of expansions. Ive played with other expansions and the simplicity goes it comes too complex and the appeal (for me) of the game is its simple roots - take a tile and lay it down and score points - EASY. Good Points: simple, easy, works on a whole load of levels. Bad points: Expansions. Inns and Buliders are the best.